Delirium is a serious and common complication of acute illness and hospitalisation (Marcantonio 2017). 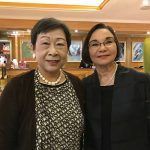 It is much more common in people aged 65 and older, and especially in people with dementia and other causes of cognitive impairment. It is associated with higher mortality, longer hospital stays, a higher risk of discharge to residential care facilities, increases susceptibility to complications such as falls and pressure injuries, and increases future risk of dementia (Marcantonio 2017). 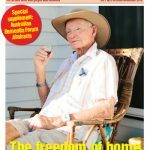 An estimated 20% of older inpatients in Australian hospitals have dementia and 10-30% have delirium (Travers et al 2013; Iseli et al 2007), and caring for patients with cognitive impairment in acute care is often a difficult and complex intervention for staff on busy wards with multiple competing demands (Grealish & Chaboyer 2015). Consequently, medical and nursing staff often under-recognise delirium, particularly the hypoactive form. Importantly, there is robust evidence that multi-component non- pharmacologic interventions can prevent delirium in more than 30% of all cases, but the implementation and sustainability of these strategies is challenging in busy acute care settings (Hshieh et al 2015). 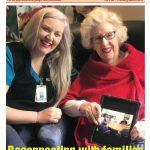 Morning tea at Royal Brisbane and Women’s Hospital is an opportunity for patients to socialise, whilst also promoting oral intake and mobility. Eat Walk Engage is an evidence-based multidisciplinary delirium prevention program developed at Queensland’s Royal Brisbane and Women’s Hospital. Building on previous improvement projects for older inpatients (Mudge et al 2008; Mudge et al 2012; Young et al 2013) and the principles of established programs such as the Hospital Elder Life Program, Eat Walk Engage focuses on working with local ward multidisciplinary teams to implement sustainable strategies to support the nutrition and hydration, early mobilisation, and meaningful cognitive engagement of older patients – all necessary for delirium prevention in this vulnerable population (Mudge et al 2015). The Eat Walk Engage program recognises that, although these interventions appear simple, they involve deliberate engagement and coordination of a wide range of health professionals, support staff, patients and families within a system that is not always older-person friendly (Queensland Health 2016). Using the i-PARIHS implementation framework with a strong focus on enabling facilitation (Harvey & Kitson 2016), Eat Walk Engage develops and supports effective collaboration among local interdisciplinary teams to improve care processes, while embedding and sustaining changes in practices and associated processes of care, involving all levels of medical, allied health professional and nursing staff. Working within each ward context, and incorporating each unique ward culture and patient cohort, a trained facilitator from a nursing or health professional background helps identify local needs for patient care recovery and any encountered barriers. 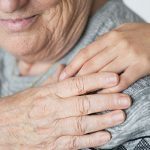 Older patients actively contribute to the assessment of barriers, enablers and program impact through structured interviews that directly inform improvement efforts (Mudge et al 2015a). Factoring in the complexity and busyness of the hospital environment, this program contends with challenges such as competing tasks (eg dressings removed for review just as breakfast is served), risk averse practices (eg discouraging patients at risk of falling from mobilising) and unclear ownership of roles and responsibilities (eg who should update the orientation boards or help set patients up for meals). However, encouraging staff to keep a patient-centred perspective, enabling team discussions and debates and advocating with decision makers helps resolve such barriers. The facilitator’s role is then to support the team to develop and implement these iterative improvements to positively support patients in their recovery. 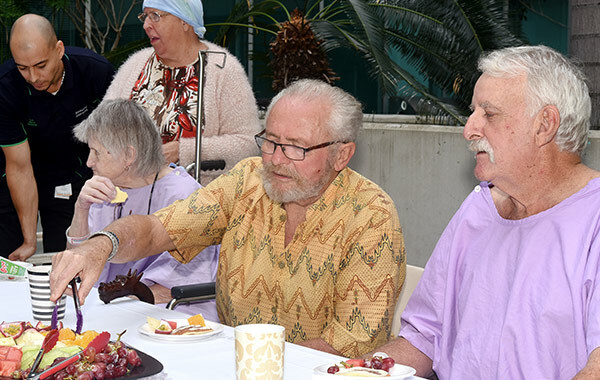 Over the past five years, Eat Walk Engage has been incrementally implemented in 10 wards across the Royal Brisbane and Women’s Hospital, including medical, surgical and oncology units, caring for high numbers of older inpatients. The program has been evaluated through pilot pre-post studies (Mudge et al 2015a; Mudge et al 2015b), through the measurement of processes and outcomes of care on intervention wards, and most recently in a large cluster randomised controlled trial in four hospitals (Mudge et al 2017). 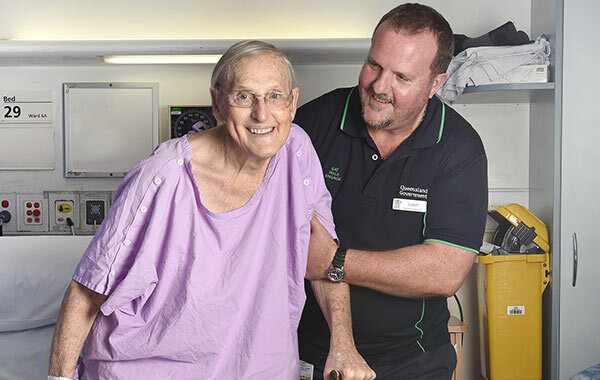 The study collected data on more than 1000 older patients admitted to wards at Caboolture, The Prince Charles, Royal Brisbane and Women’s and Nambour Hospitals, and compared outcomes on four wards implementing Eat Walk Engage and four control wards. The 2017 trial has demonstrated improvements in care processes such as mobility and mealtime assistance in the four participating wards, and will report outcome findings later this year. Several other hospitals are adopting Eat Walk Engage principles, and we plan to develop a collaborative for spreading the program within and beyond Queensland hospitals. 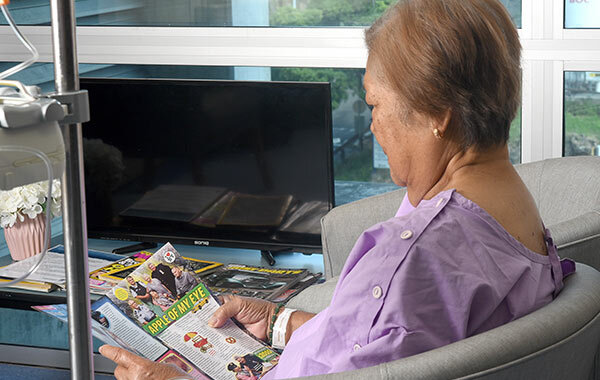 Several medical and surgical wards have implemented dining tables in four-bed bays to facilitate oral intake, social engagement and mobility in their older patients with cognitive impairment. 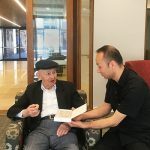 It brings a new perspective for staff to see patients who may have appeared withdrawn and quiet actively engaging in conversations with other patients while eating their meals. Several wards have instituted weekly group activity sessions for older patients, including those with cognitive impairment, to participate in various arts and crafts sessions, exercise groups and meaningful activities related to current events (eg making poppies for ANZAC Day; joining in Irish songs for St Patrick’s day). 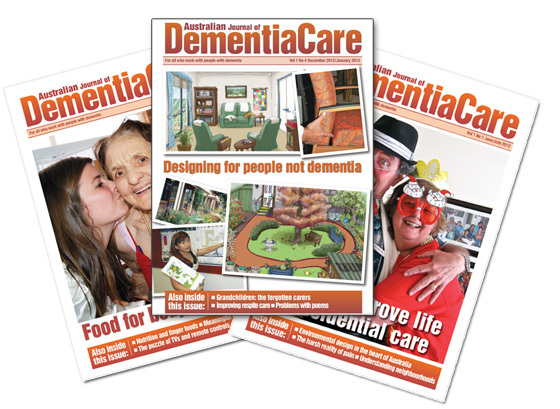 A destination on each ward for patients to enjoy social interactions or to read the paper or a magazine. Adopting signage to facilitate way-finding for amenities or places to visit. Larger-sized clocks and orientation posters to support orientation. Additionally, each ward has established a cognitive kit or cupboard in order to support patients in their ward, providing access to meaningful activities such as crosswords, fiddle blankets, puzzles and DVDs. Families are also encouraged to bring personal objects from home and participate in the provision of care. 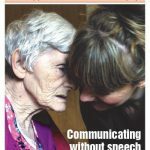 To facilitate communication between family members, the patient and the interdisciplinary team, goal-setting posters outlining patient-specific strategies such as walking to the window, attending a group morning tea, or sitting out of bed for each meal have also been instituted on several wards. Patients and their family members or visitors are encouraged to attend weekly morning teas and ‘happy hours’ to facilitate a concept of ‘normal life’ while in hospital. This enables patients to leave the ward area, optimising their mobility and oral intake while enjoying fresh air and social engagement. The patients, and their family members, enjoy this opportunity with many commenting on how this has considerably improved patient morale. These social, mobility and cognitive activities are supported by hospital volunteers and enabled by our specially trained and dedicated Eat Walk Engage allied health assistants. These assistants are integrated into the ward-based multidisciplinary teams and are trained to assist with the implementation of Eat Walk Engage strategies, delegated by all members of the team. They provide a visible face of the program. Although many of the program activities are tailored to the individual wards, the Eat Walk Engage program facilitators also contribute to organisational leadership in the care of older people through active advocacy, policy development, research and education. They have led a series of ‘Better Way to Care’ multidisciplinary one-day workshops attended by more than 100 staff in 2017. 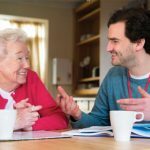 The workshops are specifically designed to enhance the care of older people, particularly those with cognitive impairment. Members of the program team have also presented in grand rounds and workshops for a wide range of health care professional audiences within and outside of Royal Brisbane and Women’s Hospital. They recently coordinated a whole-of-hospital delirium and cognitive impairment audit, using the new Australian Delirium Clinical Care Standard and are involved in a range of quality improvement and research projects aiming to improve care of patients at risk of, or with, delirium. 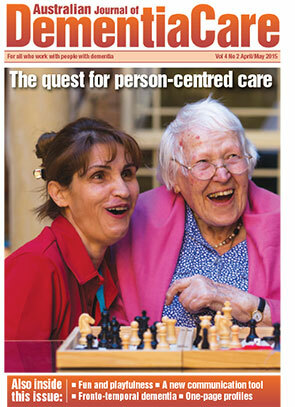 With new hospital safety and quality standards recognising the need to improve care for patients with cognitive impairment, Eat Walk Engage is a timely example of how clinicians can create an evidence-based program to support staff in the delivery of high-quality care to prevent delirium and facilitate the speedy recovery of older patients in hospital. A strong evidence base, a multidisciplinary leadership team, engaged champions working effectively in teams, and listening to our older consumers have been critical factors for its success. Thank you to the staff and patients of Royal Brisbane and Women’s Hospital who continue to contribute, support and advocate strongly for improving care of older patients at our facility. Grealish L, Chaboyer W (2015) Older, in hospital and confused – the value of nursing care in preventing falls in older people with cognitive impairment. International Journal of Nursing Studies 52(8) 1285-1287. Harvey G, Kitson A (2016) PARIHS revisited: from heuristic to integrated framework for the successful implementation of knowledge into practice. Implementation Science 11(33). Hsieh TT, Yue J, Oh E, Puelle M, Dowal S, Travison T et al (2015) Effectiveness of multicomponent nonpharmacological delirium interventions: a meta-analysis. JAMA Internal Medicine 175(4) 512-520. Iseli RK, Brand C, Telford M, LoGuidice D (2017) Delirium in elderly general medical inpatients: a prospective study. Internal Medicine Journal 37(12) 806-811. Marcantonio ER (2017) Delirium in hospitalised older adults. New England Journal of Medicine 377(15) 1456-1466. 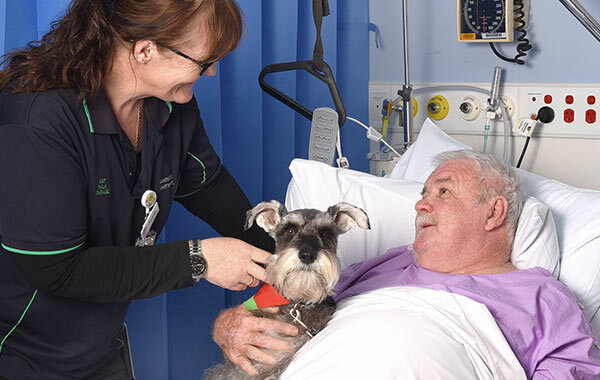 Mudge AM, Banks MD, Barnett AG, Blackberry I, Graves N, Green T et al (2017) CHERISH (collaboration for hospitalised elders reducing the impact of stays in hospital): protocol for a multi-site improvement program to reduce geriatric syndromes in older inpatients. BMC Geriatrics 17(1) 11-19. Mudge A, McRae P, Cruickshank M (2015a) Eat Walk Engage: an interdisciplinary collaborative model to improve care of hospitalised elders. American Journal of Medicine Quality 30(1) 5-13. Mudge A, McRae P, Reade M, Donovan P, Jenkins J, Foster M et al (2015b) Improving care and outcomes for older vascular surgery patients. Journal of Vascular Surgery 62(2) 536. Mudge AM, Maussen C, Duncan J, Denaro CP (2013) Improving quality of delirium care in a general medical service with established interdisciplinary care: a controlled trial. Internal Medicine Journal 43(3) 270- 277. Mudge A, Giebel A, Cutler A (2008) Exercising body and mind: an integrated approach to functional independence. Journal of the American Geriatric Society 56(4) 630-635. Queensland Health Clinical Excellence Division. 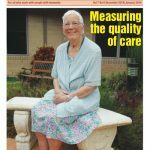 How older person friendly are Queensland hospitals? Available at: https://bit.ly/2rweuM3 (Accessed 3/4/2018). Young A, Banks M, Mudge A, Ross L, Daniels L (2013) Encouraging, Assisting and Time to EAT: Improved nutritional intake for older medical patients receiving Protected Mealtimes and/or additional nursing feeding assistance. Clinical Nutrition 32(4) 543-549.